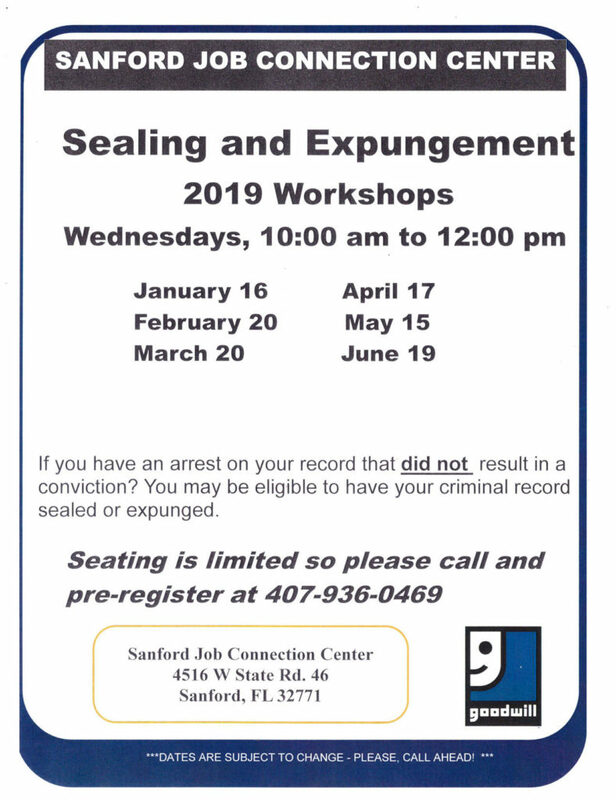 Once a month, in tangent with the Goodwill Job Connection Center in Sanford, Florida, our office facilitates a Sealing and Expungement workshop. In the state of Florida, if a person has been arrested or charged but not convicted of a crime, they may be eligible to have their record sealed or expunged. The workshop is taught by attorneys who help attendees to understand their rights and eligibility for these processes. The attorneys will also teach eligible people how to go through this process without an attorney so that they are able to do so on their own if need be. While the attorneys attending may be able to help review the case of each person that attends, it is important to understand some of the basics before attending the workshop. For example, sealing places a criminal or arrest record under highly restricted access that cannot be accessed without a court order while expungement removes and destroys the criminal or arrest record from the public record entirely. In order to find out whether or not you are qualified for either of these services, call 407-936-0469 to pre-register for one of these monthly workshops.